As parents, we are always looking for new ways to bond with our kids. The same old toys, same old cartoons, same old playgrounds, same old games can get a little jaded after some time, especially when kids grow up, and grow out of things, pretty quickly. When we came back to Singapore, it sparked my interest to read about monthly subscription boxes which promise to entertain, educate and enrich your child. Perhaps due to cynicism and cost, I continued to find my own ways of playing and bonding, particularly through crafting and outdoor activities. However, there will be rainy days when you are cooped in the house and gloomy days when your creativity is stifled, and you might just wish that a magic box filled with fun activities could instantly appear and chase away the worry of "What shall we do today?". For us, that magic box did arrive at our doorstep recently. Introducing to you the iNbox - a monthly subscription box filled with experiential activities specially designed for children aged 3 to 7 years of age. Every month, there is a different theme and the activities will vary to focus on the different themes and skills. Developed by experts, each iNbox has been created to enhance at least 12 of the essential skills below. We received the March iNbox which touches on one of Angel's favourite topics - Wildlife Safari! Yes, the lucky girl! Each box contains 4-5 activities varying from art and craft, science, board games, card games, puzzles. Read on to see what we did! After having laid out our options, which were impossible to be finished in a day, we decided to start off with what seemed like the most straightforward - book reading. Every iNbox revolves around the main character - Flinto the octopus and tells about the adventures he has with his friends. Since ours was a safari theme, the book was about a forest adventure where Flinto and his friends saved the baby animals from the hunters and brought them back to their parents. We loved the simple storyline and vibrant illustrations but would have preferred for the pages to be thicker so that it would be easier to flip and harder to crumple. Moving on, we took a look at the activity booklet. I loved that every page included information about a different animal and kids can learn about where they live, how they live, what they eat and even picked up some fun facts. For instance, we learnt that the tongue of a giraffe is blue-black in colour and nearly one and a half feet long - so long that it can use its tongue to clean the inside of its nose. Ewww. 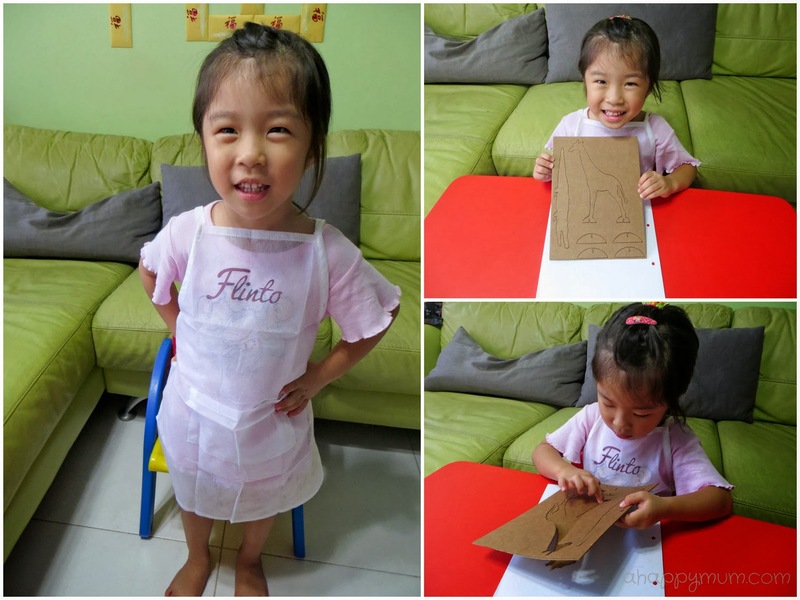 While the information was bite-sized and could be comprehended with the help of a parent, the drawing activities were way tough for a 4-year-old! I mean, "Can you draw two elephants saying hello? ", "Can you draw a mother hippo and a baby hippo in the water? ", "Can you draw an angry zebra? ", ahem, I don't even think I can do these. So, for Angel, she was contented to just join the dots, 100 of them, on the last page. Our next activity was to build a jeep! The thing about iNbox is that although it provides clear and concise instructions for every activity, it is still recommended that parents get involved so that it can be a chance for us to bond with the kids. For me, I only stepped in to help when she needed me but was always there to spur her on. It was heartwarming to see my girl try out new things like fastening nuts and bolts (even if they were plastic ones) and assembling boxes. And ta-dah! Her jeep was all done! It was indeed quite an achievement for her and she ran around showing everyone what she accomplished. Next up, the sisters did something they never did before - play a board game together. This safari board game is simple and straightforward - all you need to do is throw the dice, move your token, collect heads and tails of animals and be the first to form four complete animals. Did the game go smoothly? Who am I kidding? Since Ariel was, and still is, too small to understand instructions, she was either tossing the dice onto the floor, messing around with the tokens or jumbling up the cards. Can't blame her, can we? Nonetheless, it was a good opportunity to teach the elder sis to be more patient with the younger one and one way or another, we did manage to finish one game at least. Lastly, the activity that Angel loved the most was the finger painting. Look, the iNbox even comes with a cute little apron! Firstly, she had to punch out the animals from the sheets. Next, it was time to get creative and paint! It had been a while since we played with finger painting so I was glad that the iNbox motivated us to do so. We coloured the animals, painted on spots and mixed colours to form new colours. Did you know? Green, red and yellow combine to make brown! 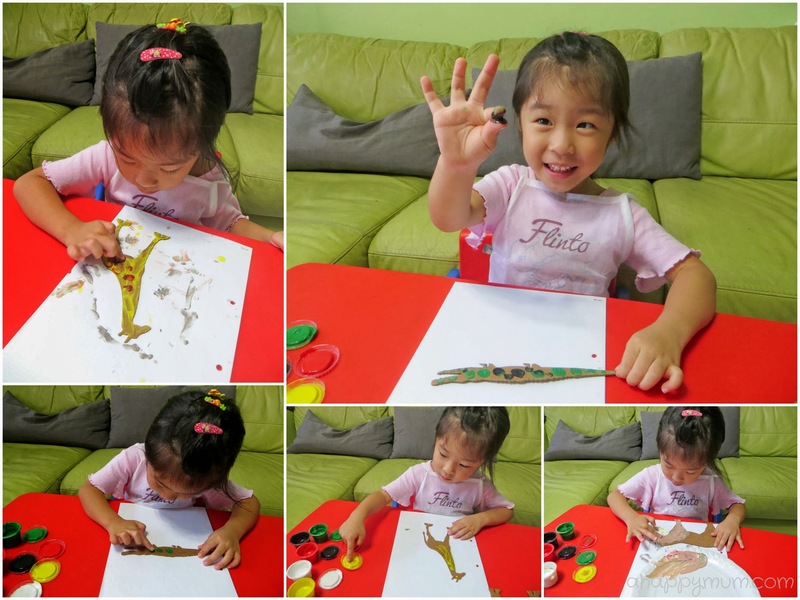 This was something I learnt from her art class at heART Studio and so we mixed the colours to make brown spots for the giraffe. In fact, other than reminding her how to mix colours, she painted all these safari animals on her own and I must say she did a pretty awesome job. A happy kid on an otherwise boring afternoon, I have to say I am loving all the magic in this one box. iNbox is produced by Smart Alley and is currently available only through their website or myinbox.sg. You can also visit their Facebook page for more details. 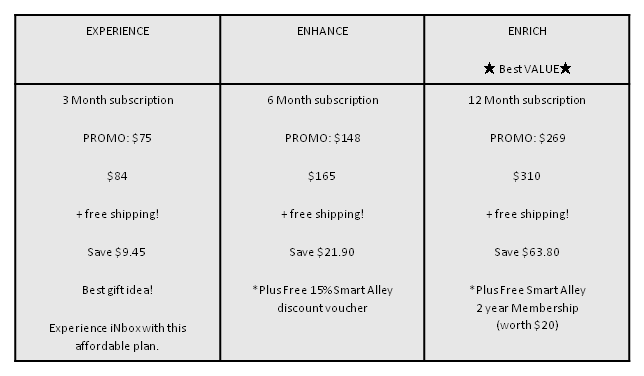 From now to 31 Mar, iNbox is having a promotion for its subscription. To celebrate the launch of iNbox, Smart Alley is also giving away 100 free boxes for the March Wildlife Safari Theme. 1. Log on to www.myinbox.sg. and click on “I Want My Inbox” button. 2. Read the Terms and Conditions and register your details. 3. iNbox will be delivered to your door step in 3-5 days! I hope you'll have fun too! Disclosure: We received a complimentary iNbox from Smart Alley in writing this review. All opinions are my own.